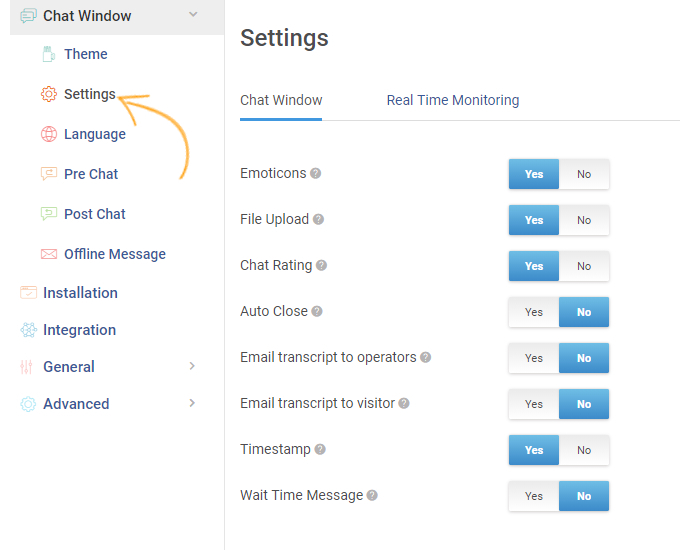 Visitor Chat Window Settings | How to customize visitor chat window? 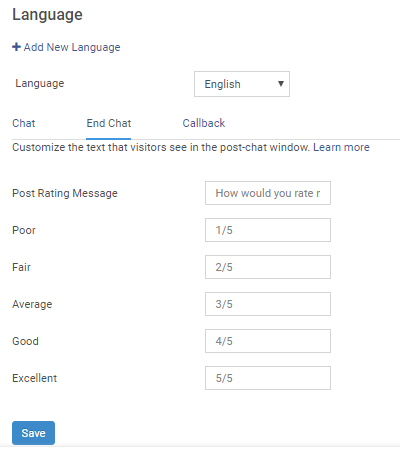 Make chat window an integral part of your website using live chat customization. 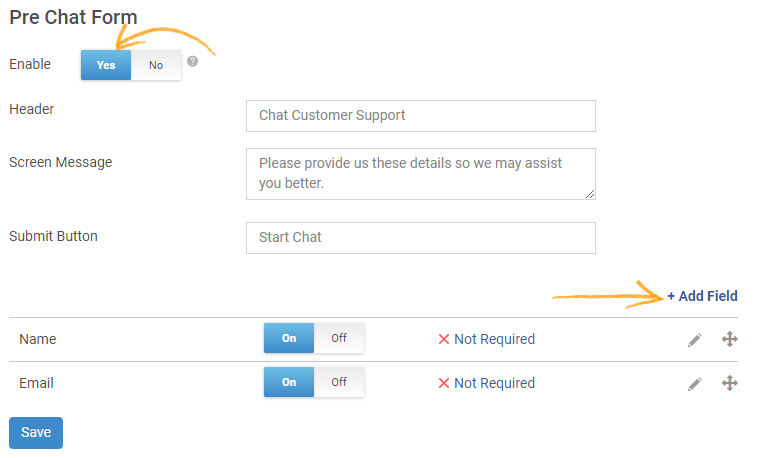 Create a seamless support experience for your site visitors with powerful chat window settings. Change the shape and style of your chat icon to help it blend well with the theme of your website. 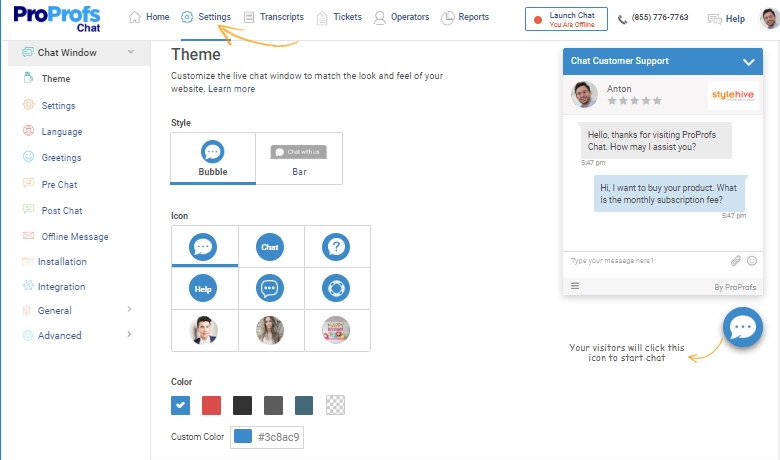 Here you can change the chat window design by providing various color and font options, you can make sure that your brand logo is visible in the chat window. Step 1: Navigate to "Settings" -----> "Chat Window" -----> "Theme." Step 2: You'll see a sample chat window on the right and options to change the color and theme of chat window on the left. Select a style(bubble or bar) and then select icon and theme color. Step 3: Scroll down to change your avatar and logo, you can upload your own image for both. In "Advanced" options you can customize the visitor and operator text color, chat box position and size, and do the CSS customization. 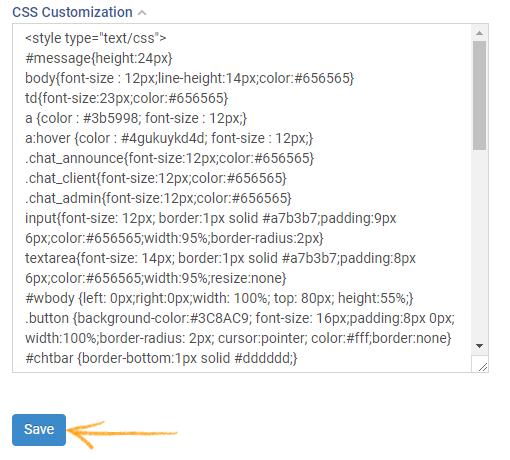 Step 4: Click "CSS Customization" in advanced options, a textbox with CSS code would appear (see screenshot below). Make changes as per your requirement and click "Save." You can enable emoticons in chat window settings to make the conversation more engaging for your site visitors. Also, allow your operators and site visitors to share files during a live chat. The software settings allow you to send a chat transcript automatically to operators once a session ends. Step 1: Navigate to "Chat Window" -----> "Settings." 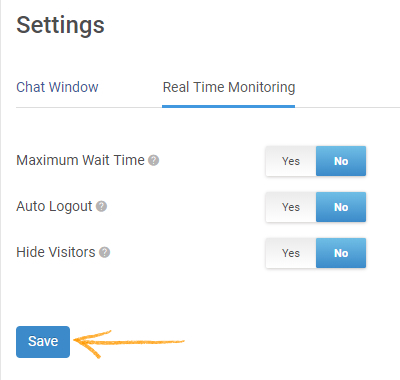 Step 2: The settings section has two sub-divisions, navigate to the 'Chat Window' tab and enable the desired options, every option provides brief descriptions to help you understand the feature. Step 3: Similarly, switch to Real-Time Monitoring tab and enable desired options. Click "Save" to secure and implement the changes. You can delight visitors by providing support in their native language. Switching from one language to another has never been this easy. 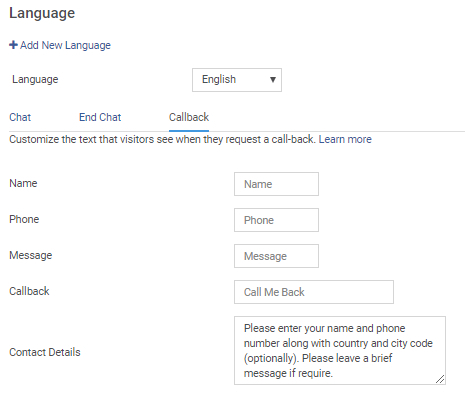 All you have to do is visit the language settings, click the drop-down option and choose the language that your operators will be using while providing support to your site visitors. The tool also allows you to customize languages based on the visitor’s location. Step 1: Navigate to "Chat Window" -----> "Language." Step 2: To add new languages click "Add New Language." Step 3: Select the language you want to add from the list and choose the status of the language. Click "Save." Step 4: When you are done adding languages, you can customize the language settings which are divided into three categories. (i): Chat - Language settings for live chat. Refer to the screenshot. (ii): End Chat - These messages will appear once the chat with a visitor is over. (iii) Call back - These messages are shown to the visitors when they request a callback. Step 5: Click "Save" to secure the changes. Note* The text of all the messages can be changed as per your language change and requirement. Navigate to "Chat Window" -----> "Pre Chat Form." Enable the form and customize the options. 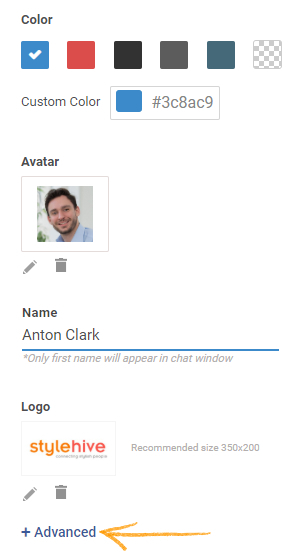 Click "Add field" to include more fields to the form. Click "Save" to implement the changes. 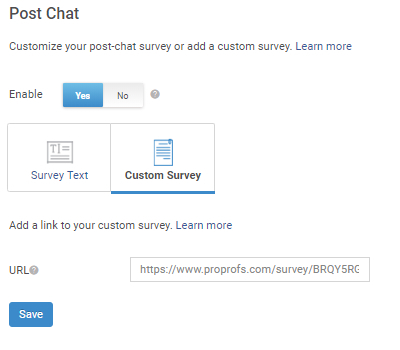 With ProProfs, you can add a post chat survey for your visitors, which allows you to gather invaluable feedback. Navigate to "Chat window" -----> "Post Chat." 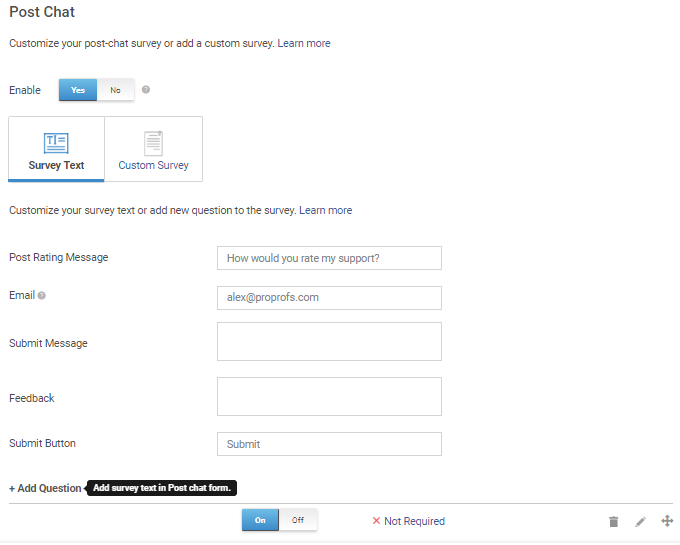 Enable the form to customize a post chat form for your visitors. To gather instant feedback, you can set up custom fields. 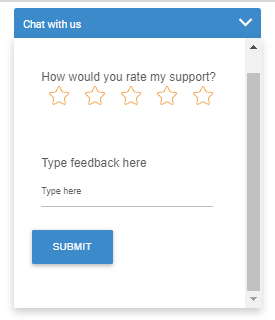 Gather essential feedback by embedding a survey on the chat window which will appear to the visitors after the chat is over. Enter the survey URL and click "Save" to secure the changes. Visit ProProfs Survey Maker to create your own survey! 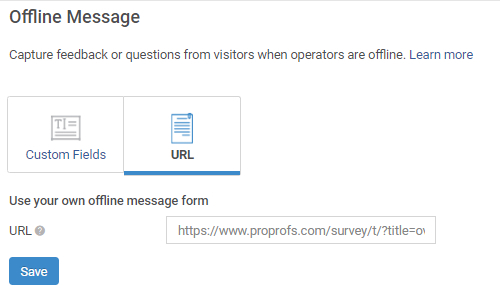 You can set up an offline message form for visitors when your operators are not active. 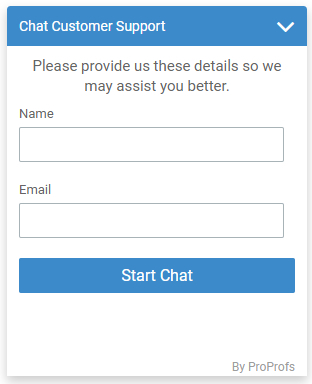 Visitors can fill this form and live chat reps can connect with them later. 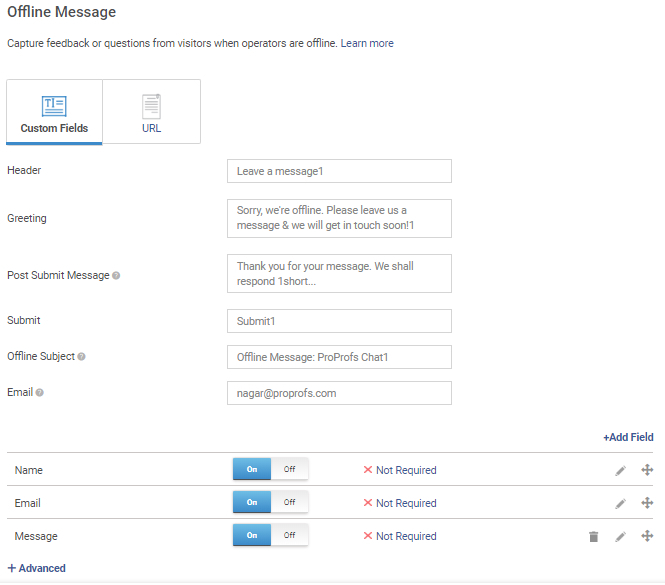 Offline message form is fully customizable, and you can edit or add fields according to your business needs. 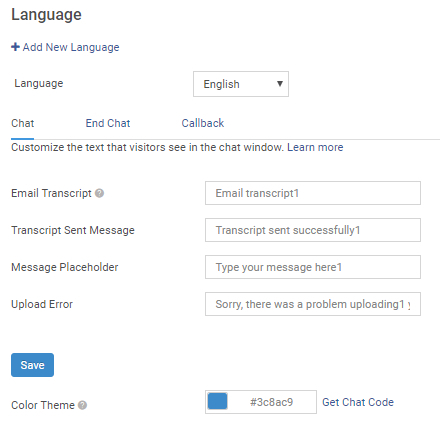 Step 1: Navigate to "Chat Window" -----> "Offline Message"
Step 2: Set up the custom fields for the offline message. You can add, edit or delete any field as per your requirement. You can embed your own survey as an offline message. Enter the URL of the survey in the box and click "Save" to implement the changes. 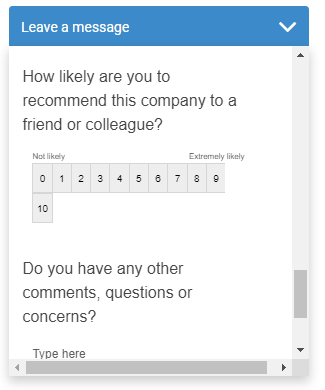 Create any desirable survey with ProProfs Survey Maker and include it as an offline message for your visitors.